A close compadre and I set out from SFO in the wee hours of last Thursday morn for grey and monotonous Mississauga, Ontario. The little corner we inhabited for close to three days was far from the drab exterior of Canada’s most mundane province however, and our neighbours and visitors were determined paint the conference center red. 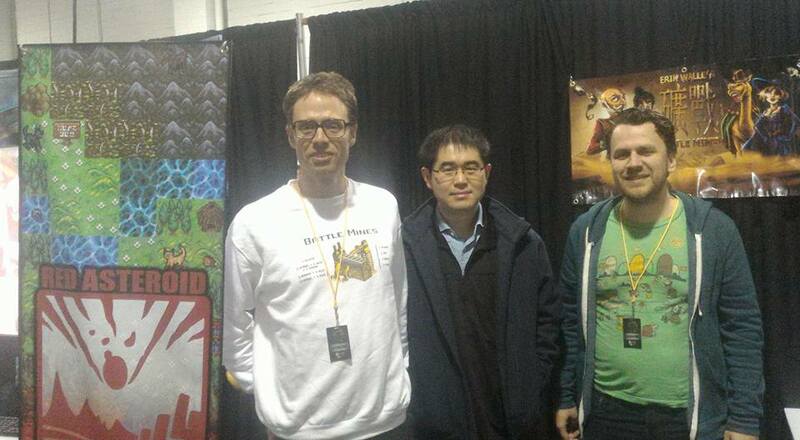 Yes, we hosted the Red Asteroid Games booth at EGLX 2016, and boy did my voice get sore pitching Battle Mines, Overworld, and all things indie. We gave out about 150 pamphlets, even more stickers, collected dozens of signups for the mailing list, and won many converts to the fold in that stretch. I also gave an interview that I’ll link to when available, a talk on MMO development likewise, and met lots of business-minded types eager to coordinate for future successes. Thanks to the awesome guys who made it happen, and welcome to any new fans of our games. Santiago was excited to see his work on display half a world away, and I was proud to put it there. I’ll close with an Overworld animation comparison, vive la différence! Great news, the public alpha went brilliantly, special shout out to young Nick who put in a solid two hours of play testing! Expect to see more of this soon, a little more polish and we might have to see about putting together a public beta. Exciting times, check back soon for updates!